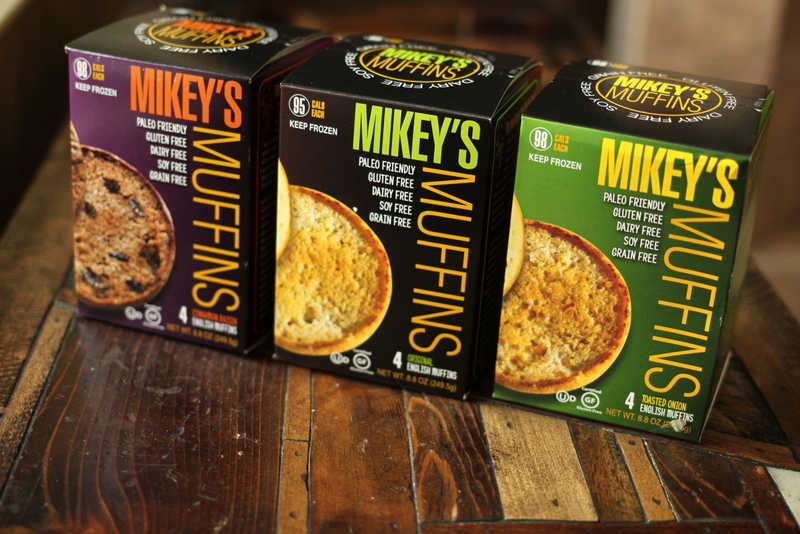 Today I am giving away a 3 pack of Mikey’s English Muffins! Ingredients are: Eggs, Almond Flour, Purified Water, Coconut Flour, Baking Soda and Kosher Salt! 1. “Like” my Facebook page and share my info with your friends and family:). 2. “Like” Mikey’s Muffins on Facebook. 3. Leave a comment below on what is your favorite recipe of mine is. A winner will be picked July. 11th. Good Luck! While I was on the Low Carb Cruise one of the ketogenic doctors that spoke asked why I even allow sweet treats even if they are made with stevia or Swerve? I proudly stood up and found the most confident voice I could. I stated how I have 2 toddlers who are bombarded with images of cupcakes, candy, juice boxes, cereal at birthday parties and advertisements all with fake bright colors to catch their attention. So in order for my kids to not rebel and eat that junk, I offer safe treats at home. Micah even asks if certain things will give him an “owie in his belly” and I will say probably. He asks if we have cupcakes at home that won’t give him an “owie” and I either say yes or we can bake some. He gladly chooses the safe treat. (He doesn’t have celiac, but the sugar and grains make him feel ill which often happens to clients after months of not having sugar/starch). I found it interesting that this doctor was so critical of my treats since he has triplets that are in elementary school. I think he too could benefit from my treats for his kids during special occasions instead of giving them sugar-filled “food.” He also joked about almond milk and that you “can’t milk an almond!” When I told Craig what he said, Craig replied, “What do you think tea is? It is infused water, just like almond milk.” I don’t get fired up much, but criticizing my practices hurts. I never feel the need to cheat on my ketogenic lifestyle of eating because I can have “healthified” treats once in awhile. If I couldn’t, I know I would be too tempted to grab junk. 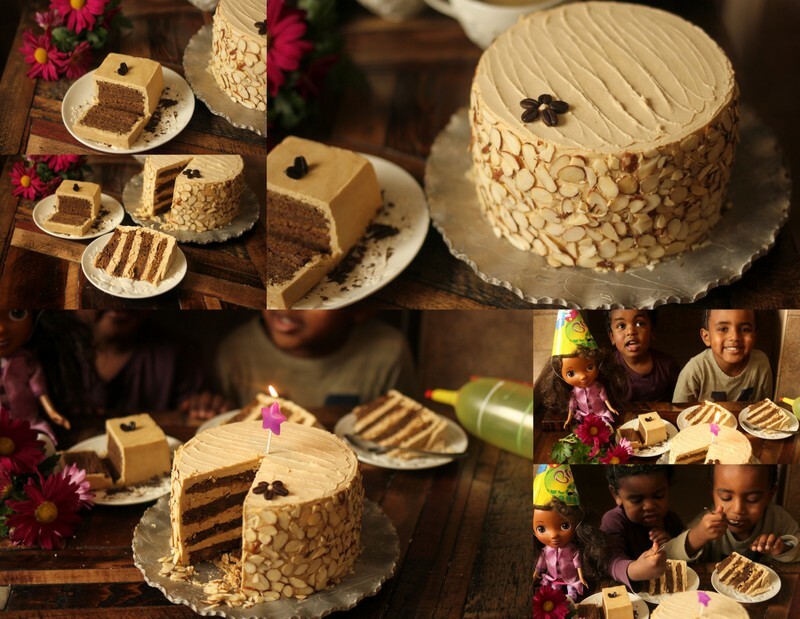 I also love to entertain and serve desserts that we can all enjoy; I even love to throw parties for dolls! My son Micah has a doll that he named Libby. He loves her very much and most days at nap time I have to tell Libby to close her eyes and stop talking to Micah (he talks to her non-stop during nap time). Anyway, Micah came up to me and told me it was Libby’s birthday in 3 days. So I decided to take him seriously and decided to throw a party! Preheat oven to 325 degree F. Grease a 15 x 10-inch sheet of parchment paper. Line 15x10x1-inch baking sheet with prepared parchment. Place the coconut oil/butter in a saucepan on medium heat and slowly add the chocolate (don't burn the chocolate). Add the natural sweetener and extracts. Let cool in fridge for awhile. While it is cooling, separate the eggs. Place the whites in a stand mixer and whip until stiff peaks form. Once the whites are stiff, slowly add the yolks. Once the chocolate mixture is cooled a bit and warm to touch, add that to the egg mixture. Pour the mixture into the prepared cake tin, smooth the top. Bake cake until tester inserted into center comes out clean and cake begins to pull away from pan, about 18 minutes. Cool cake in pan on rack 30 minutes. Cut around pan sides. Slide spatula under parchment to loosen from pan and invert cake onto work surface. Peel off parchment. Cut cake crosswise into 4 rectangles, each about 10 x 3½ inches. Or if you want a round cake, cut into circles about 10 inches round. While cooling, make the Syrup, Filling and the Frosting. NOTE: This cake will be more cake-like after resting a night. You can make the cake part the night before if desired. For soaking syrup: Bring espresso, almond milk, natural sweetener and extract to boil in small saucepan. FILLING: Combine natural sweetener, espresso, 2 eggs and cocoa powder in heavy medium saucepan and whisk to blend; add coconut oil or butter. Whisk constantly over medium heat until mixture thickens and coats back of spoon thickly (do not boil), about 12 minutes. Pour mixture through strainer into medium bowl. Stir in the extracts. Place bowl in larger bowl filled with ice water and whisk occasionally until filling is cooled completely, about 15 minutes. Can be made 1 day ahead. ASSEMBLE: Place 1 cake rectangle on platter (I made mine into a round cake, but rectangles work too). Brush 2 tablespoons soaking syrup over. Spread ⅓ of espresso mousse (about ¾ cup). Repeat 2 more times with cake, syrup,and mousse. Top with fourth cake layer; press lightly to adhere. Spread the brown butter frosting over top and sides of torte to seal, then sprinkle with slivered almonds if desired. DO AHEAD: can be made 1 day ahead. This looks wonderful! Thank you for creating such yummy recipes! my favorite recipe is your chocolate chip cookies!! yum! yum! Our favorite …. to many to list it is so very wonderful that when we try a recipe it always turns out delicious. I just love the new cookbook (3 in 1). I have to say our latest favorite is your lemon bars and the meatloaf cupcakes. We feel so good, still have a ways to go for weight loss but sleeping like rocks and we have lots of energy and NO pain!! Thank you so much!! Ok, so the last week I have had over 5 people tell me “you look so skinny! How did you do it? !” And I explained to them I eat whatever I want but it is the Maria way. I have been doing this for 3 months. I don’t know how much weight I have lost bc I have been doing this for health not weight loss….but I can say I bought a size 4 skirt this week from old navy when I normally would have bought an 8 or a 10. Thank you Maria! I love your granola and eat it every day!! I love the chix cordon bleu recipe in the crockpot cookbook. I do too! I just made it again last night. It is a little runny, but the juice is delicious. I put it on riced cauliflower. I even made it for company on Easter 🙂 Thanks so much! Your toasted sub rolls, taco seasoning, chili, there are TOO many to pick from! Almond cookies are my favorite. I looooooooove your cinnamon roll recipe! And the lasagna roll recipe…and the southwest tabouleh recipe…argh, I can’t pick just one!! My favorite recipe is your carmel sauce. If I need a sweet taste I make the sauce and add pecans and drizzle with melted chocolate and make little turtles. The Keto muffins look delicious. And this cake… Must try! Thank you! We love the mexican lasagna! 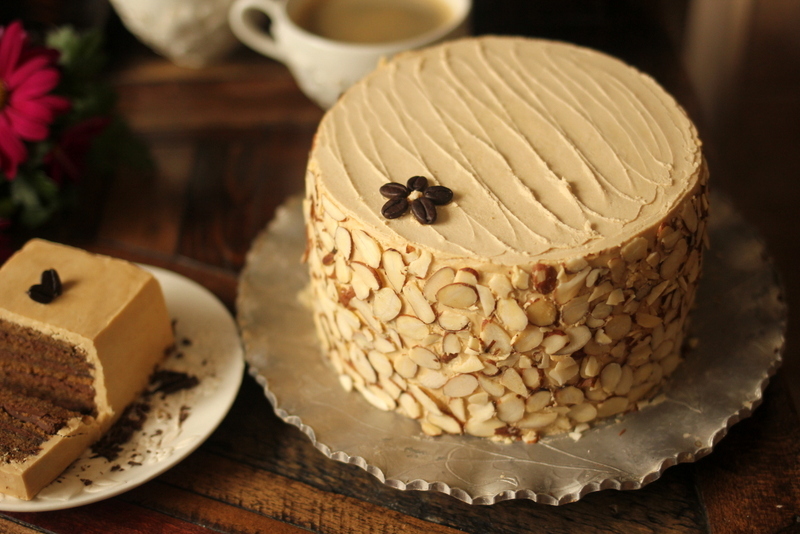 I am a first time visitor to your blog and can’t wait to try the Almond Rocha Mocha Cake. Looks yummy! My favourites are the nutella-cookies! I recently made the crockpot walnuts and they are great! Those look so delicious considering I haven’t had any bread in quite a while! I have a lot of favorite recipes (like the lemon bars and chocolate chip cookies! ), but the one I make the most is the chicken lettuce wraps! Our favorite recipe is the protein bun recipe. These are great for so many things and we use this often. Are these buns bread like? I am trying to find something that is most like bread (not spongy from eggs or hard from egg whites). Thanks so much. I love your zucchini brownies but this recipe looks like it might become a new favorite! I LOVE your vanilla bean cheesecake…..actually my whole family loves it – even my picky 8 year old!! Still experimenting and expanding my repertoire but so far enjoy the protein waffles. I am so thankful to have found your site. I am looking forward to learning much as I have begun a keto way of life. Thank you! We had the cioppino rom your slow cooker book last night – so good! Also love the French dips, adobo chicken and chili from the same book. The almond joys are my go to sweet fix. Thank you, Maria! I make a double recipe of your protein waffles every week! Great breakfast and snack! My kids love them. My favorite recipe is, hands down, your Reese’s Peanut Butter Eggs! They’re not just for Easter, but for a sweet tooth! Your chocolate chip cookie recipe is my favorite! I would say that my favorite recipe of yours so far is the thin mint donuts but this cake sounds yummy too. I can’t wait to try it. The Chocolate chip cookies, and protein waffles! I love the nut cereal from your crockpot book! Looks amazing!! Very beautiful and impressive. Your recipes rock. Love your blog. I love your creme brulee recipe… so yummy. I would also love to try these English muffins! your chili cheese “fries”! love your pages and blogs! I love the beef stroganoff recipe for the slow cooker. Also, make my hard boiled eggs in the slow cooker all the time. So easy and no fuss – no mess!! And they always turn out perfect! I love everything of yours I’ve ever made!!! Oh hard to say! Maybe this cake will be it :)? The Twix Bars. I love the chocolate zucchini cake. Sloppy Joes are my favorite at the moment! I love your low carb onion rings!! I love your white chocolate macadamia biscotti! I love your protein waffles. I can’t pick just one they are all so good! Love your sub sandwich buns. Having these muffins would allow me to have something in the freezer so I wouldn’t end up baking on hot summer days. Thanks for the opportunity to win. I’m currently going through the slow cooker cookbook…..not sure what the favorite is yet. Next is dessert….this cake looks great. My favorite recipe is your pizzas! I LOOOVE the keto fudge. I also eat a lot of the protein bread. The Chocolate Chip cookies for sure! My fave is the flour less chocolate torte!!! My favorite recipe is your chili!! Liked, liked, and shared! Would love to try the English muffins!! The cake looks amazing too. Thank you for all you do!!!! CHICKEN “NOODLE” SOUP is awesome! I have been wanting to try those. Since I am focused on weight loss, I have not ventured into many recipes beyond your 30 day accellerated meal plan, though I have one of your cookbooks. One of my favorites is your Healthified Chili made in the crock pot. The house smells great and I eat it every week!! This looks amazing. I am impressed and amazed at how you can healtify just about anything. i LOVE your risotto recipe! Delicious! I just bought your slower cooker book for my husband, for Father’s Day. I’ll let you know then our favorite recipe. Protein bread right now, Go Keto Adapt!! All of your recipes are great! That’s why I own every cookbook and book of yours! You rock! I love many of your recipes, but one stands out for sure: peanut butter chocolate chip muffins. Whenever I make them, they are gone within 2 days. Haha!! My fave is your Cheese Danish recipe. I love having people over for tea and serve them all the time. I let people taste one and if they like it I bake them a dozen to take home next time we get together. OMG this looks divine! Gorgeous photo! I’m off sweets right now but can’t wait to try this one day on down the road, Maria. Sounds delicious. The protein bread for now, but that will probably change with all your great recipes. Hard to choose, but I think my favorite right now is the slow cooker chicken curry. I don’t have a slow cooker, but I just cook it in a dutch oven in my oven for several hours and it turns out delicious. A close second is chili, mmmm. I just ordered some Mikey’s Muffins, can’t wait to try them! It’s nice to have something around that I don’t have to make from scratch. My favorite is the amazing bread. I like an egg sandwich in the morning. Love anything sweet, but enjoying the chili right now!! I would love to try both your cake and these English muffins! WOULD LOVE TO TRY THESE MUFFINS , ESPECIALLY ONION– I MISS ENGLISH MUFFINS !! I love your amazing bread for buns-esp since its grilling season now. Hamburger and hotdugs buns-yum! I know the recipe by heart now. I would love to try these english muffins for when I don’t have time to bake for my husband who misses bread!! One of my favorite recipes of Maria’s is her chili. I don’t miss the beans at all that I use to put in my chili recipe. Maria’s chili is so full of flavor!! I find it hard to choose a favorite recipe. I like all of them. My favorite of your recipes (at least if we’re basing it on what I make most often) is the cabbage hash browns! SO convenient to keep some shredded cabbage in the fridge and fry up a quick hash brown for any meal! We love the protein waffles. I love everything I try. The chili is yummy and I think I’m still working on improving my protein bread skills. I enjoy all the cookbook recipes. 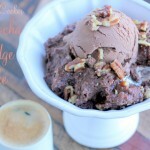 I adore all of Marias ice cream recipes – ice cream is my kryptonite! I especially love the mint chip flavor. The cake looks delicious! I have loved every recipe I have tried. I absolutely love the avocado brownies!! There’s so good, no frosting is needed!! I love your BLT coleslaw and all your other Paleo recipes. I have trying to find a good recipe for english muffins but if you can get a good muffin – no need to bake them yourself. Been dying to try them. Hands down the best recipe I have tried yet is the cheesesteak recipe! Took forever to prepare but we were in serious food love from that one. I love your sweets, but every sweetener causes me severe intestinal distress. I’ve finally figured it is because of leaky gut. You mention leaky gut in your books, but I’m unclear what to do to heal it, which supplements from your books will help with that. I’ve lost 35 pounds since going keto 3 months ago, with no supplements. I had to cut dairy (boo hoo), which I did for a full month and then made my favorite chicken wing dip (with cream cheese, sour cream, and cheddar cheese). I gained three pounds overnight and had severe bloating from that dish, so at least until my gut heals I have to be dairy free. I planned on losing 30 more pounds to reach the weight I was when I got married, but I’m thinking maybe I will try to go further to reach my high school weight! I’ve never been skinny and don’t want to be, but eating this way just might lead me there. I’ll let my body decide what size it wants to be, and I’ll just eat healthy forever! I’ve said it before, but I’ll say it again and again…Thanks so much for sounding the alarm and educating me via your blog and books! My life is changed! One quick question…what about monk fruit extract? You’re asking a VERY tough question. SO many delicious things! But so far I think my favorite is Shrimp Scampi, followed by angel food w/ lemon “filling”, because I cut my piece in half and spread the lemon stuff in the middle. I haven’t tried a recipe yet that my husband and I did not completely love! The freezer is filled with all of your yummy and healthy foods and I thank you! Love those chocolate chip cookies! 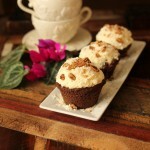 I have already ordered these muffins, as it is so time consuming to bake all the time. I am having trouble making time for myself to follow Keto 100% and I blame my weak will-power. BUT, since I am a teacher and I have the summer off (other than teaching summer school for half a day), I am going to use it to get the push start I need. I KNOW eating Keto works because when I go for more than a week being consistent, I feel great. Please pray for me that I can do this and stick with it..simply for the fact that I KNOW it works. We gave my Mom and ice cream machine for Mother’s Day and we are having so much fun trying all of Maria’s ice cream treats! Our family will NEVER go back to buying store bought ice cream. I have no idea where to find these muffins, so, I’d sure love to win them! The only english muffins I feel even remotely safe eating are the Ezekial, and even those are really border line! So, if I could try these and have a better alternative, that would be awesome! Oh yes!! Powerful words. I find that if I don’t have “treats” around, at least occasionally, I am drawn to other junk. The difference is that my “treats” nourish my body as well as satisfy my taste buds in place of the over-processed, white flour and sugar laden “treats” that most indulge in. Love, love your brownie recipe, it is Licious!!! Chocolate chip cookies are our fav recipe!! The lasagne rolls from a post a few weeks ago are a favorite dinner “go to” for our house now!!! Love them!! I so love the recipe for deep dish pizza! Cinnabon coffee cake is my pick…I love coffee cake. To be able to eat it with no guilt is amazing. Thank you. Maria – I LOVE your blog & all your fantastic recipes. When reading a recipe, I like to take into account what other people comment about the recipe. When you include your Giveaway entry in the comment section of a recipe, it is hard to weed through all the entries in order to read actual comments about the recipe. Just wondering if there is another way to view recipe comments without slogging through all the giveaway entries? I love your Healthified Granola. It has saved me from going off track several times. Probably because it makes a large batch and is always available to just grab and go. There is no way I can pick one of your recipes I haven’t found one yet that wasn’t fantastic. . . my husband and my grandson love everything I make from your recipes, as do I! Thanks to your recipes and guidelines my husband has lost 52 pounds and I have lost 30… we both still have a ways to go but using your recipes I know we’ll make it! I love your donuts with the peanut flour! Love all that you do!! Ordered the ice cream maker from your store, looking forward to trying it out for all the summer treats!! Sure would love to try these muffins!! Love you!! Tomato basil parmesan soup and nutty noodles!! 🙂 yum! Really, there are too many to pick from but we always have protein waffles in the freezer…….and all your cakes are delicious. I use your recipes for my kids birthday parties as well and all the moms are always shocked to find out the cake and ice cream are all sugar free. Best ever chocolate chip cookies! Its great to have a cookie waiting in the freezer for when those moments strike. My absolute favorite is the Reeses PB cereal! Thin crust pizza! Yum and thanks for all the good stuff. Maria-you’re one of the people who have helped me understand how unbelievably diverse and satisfying eating low-carb can be. And although I tend to do my best when I’m also eating a great deal of vegetables, I *love* the fact that there are so many ‘healthified’ treats out there. You always start my day off hungry Maria! Does all of them count ? Thank you so much for including sweets in your recipes. There is definitely a place in life for them and knowing we can eat guilty free is so awesome! I think if you omit some of these things, you just crave them more when you pass the ice cream shop, bakery, or cookie stand. Keto Fudge is my favorite. White Chocolate Keto Truffles are my fave. I just found your site from ibreatheimhungry so i haven’t had a chance to try anything! There are so many recipes I want to try but haven’t yet. I love the cauliflower rice and my family who loves grain and potatoes, would prefer the real thing, but do like the taste of fauxtatoes and the cauli-rice. I plan on purchasing one of your cookbooks soon, too! Chocolate Chip cookies are so good. So hard to decide a favorite! Pumpkin Bread or the Lemon Curd with Lemon Poppyseed muffins…..it’s a tie. WOW- too many to choose from! Waffles, Protein Bars, Almond Joys, etc etc etc! THANK YOU! That cake looks so awesome! I love the cinnamon roll recipe!! Hubby really liked it too! I’m really interested in these muffins as there used to be a product called O’So’Lo muffins that had absolutely negative impact on my blood sugar, filled me up and the cinnamon raisin tasted just like french toast when toasted. I know it was wheat free, but can’t remember the ingredients other than inulin. I think they went out of business because there were no preservatives and sometimes the product would be moldy if the retailer didn’t put them in the freezer or cold section. Anyway, long story short, I’ve got to try these. I could survive on a single O’So’Lo back in the day. I hope these are comparable!! These sound so good, I’d love to try them! Thank you!! That cake looks so good!! Wow! This is a lot of work for a doll’s birthday! I love your treats but have been busy & stressed lately and resorting to unhealthy treats and it has shown on the scale. Back to basics here but the muffins would be fun to try! Sounds like I need to make your chili! So far have liked all you recipes, I want to buy the combined book as soon as I have the extra cash! I love this website and facebook group! Started with the chocolate chip cookies YUM!! And I keep trying more and more recipes. They are all so good! I have lots of favorites, but my latest favorite is your Healthified Sub Bread! I haven’t had a sandwich in two years, and I’m now in sandwich heaven! I’ve even tweaked the recipe several times (added nutritional yeast, protein powder, etc.) and found it to be a no-fail, always-delicious recipe! Thank you!! I would like to try the muffins. love, love, love everything I have tried that you have recommended…would love to try these!!!! pick me…pick me…. My favorite is your low carb bread bowls. I make clam chowder using cauliflower instead of potatoes (the sweet taste of the cauliflower is SO great with clams), and served in your bread bowls, it’s unbeatable! A family favorite! I love the Reese’s chocolate peanut butter muffins. “HEALTHIFIED” PUMPKIN BREAD is sooo good! Love the Keto Chili. Easy to prepare and have tons of leftovers for the busy workweek schedule! Delish was the first word that came to me!! Love your shamrock shake! I make a version of it almost every day, sometimes changing different flavorings. There are so many of your recipes I love, but the one I make the most is the Keto fudge! My favorite Maria recipe is Healthified Angel Food cake! It tastes just like the high carb version! I am not on facebook, so cannot enter your drawing, but wanted to say that the cake recipe looks amazing. I’m making banana walnut granola right now. B but my favorite is the dutch baby. My hands-down favorite is your flourless chocolate cake! Anything dark chocolate is the bees’ knees for me!! Thanks for being you, Maria! Waffles!!! I use them as a sub for bread when we are on the go!!! They rock, and taste Ah-mazing!! We have all your cookbooks and love your recipes. My favorite is your chicken wild rice soup. I love your keto fudge recipe! Our favorite are the protein buns. I love your Chocolate Mousse! It saves me from giving in to ice cream cravings. my favorite so far are your lemon poppy seed muffins and crepe with cream cheese recipe!!! My favorite recipe is the flourless chocolate torte from the 30 day meal plan. I also love the Korean Short Ribs. Really I love all your recipes! We love the Seafood Risotto! I love your strawberry cupcake recipe. My favorite recipes are your pumpkin swirl cheesecake and the tortillas with psyllium husk! I love your protein roll / pizza dough recipe the best! I am baking a double batch of it & freezing them. In less than 48 hours will be going through rotator cuff surgery on my left shoulder. Which means I will not be able to use my kitchen appliances for 6 or 8 weeks. Sept 25, 2013 I had surgery for 2 detachments on the right shoulder. It was a tough recovery and only wished I had been proactive then with my baking because doing with out rolls, bread & pizza was difficult however I never caved. Mikey’s Muffins would be a wonderful addition to what I’m baking. My favorite recipe is definitely the cheese-it’s!!! I love the German Chocolate Cake! Favorite recipe of yours varies but right now I’d have to say the “hamburger helper” made with eggplant. Love it! My favorite of the week is your Shamrock Shake. We love your protein waffle recipe! Your basic sandwich bread is a lifesaver! But I love many of your recipes. rhubarb crisp!! Tis the season! Among my faves are you coffee cake, caramel and the fantastic onion rings in fact a Mikey’s English muffin with a grass fed hamburger topped with one of your onion rings would makr an amazing summer dinner! Too many to pick but I want to try the protein bread. Can you use egg white powder instead of all the egg whites or egg whites in a carton? Seems like a lot of egg yolks left not sure what to do with all of them. Help! I have been enjoying your protein bread! My favorite recipe is your granola!! Protein buns!! They are a life saver! I can only eat so much salad. Liked Mikeys. Liked your page eons ago. Thank you for all you do, Maria! I love all, but one of my favourites is Coconut Lime Chicken. I just love it as well as my friends in Portugal and in Turkey!!! I love your cheesecake recipes……..I don’t have a fave but all I have made are delish. Love your Apple Bundt cake recipe! chocolate chip cookies and many more. I love this cookbook. I love your keto fudge! It’s my favorite recipe. I am so looking forward to making this soon! I’m not a big cake person, but every once in awhile I want some & this looks amazing! I love both your sub roll and chocolate chip cookie recipes the best. I love the protein bread and buns recipe. Thank you for the wonderful recipe…I really need to started making these keto treats and breads so I can transition my son to this way of eating without him feeling deprived. Thank! My favorite recipe would be any cheesecake recipe. If you can healthify something like cheesecake why not !! YUM. Thanks for all your information and your recipes ! I love everything I’ve tried, but the sub buns are a ‘life-saver’ (my husband’s). I love everything I’ve tied as well, but your amazing bread had all my friends amazed that it was low-carb and grain-free! It is exciting to find a pre-packaged healthy treat for those times when we are on the go, etc. I love the chocolate flax muffins, all of your breads/rolls, the risotto, and my kids love the crackers. Also, your chocolate chip cookie dough blizzard made delicious ice cream bars :). Needless to say, my children would not be able to do no gluten or sugar without your creative recipes. My sons’ favorite candy bars have all been “healthified” by you; therefore, they have not asked for any “junk foods” since we started eating the Maria way. Thank you! I just found your website today and I’m really excited about trying your recipes and learning more about your way of approaching food. It is so clear you love what you do – thank you for sharing your passion with us! 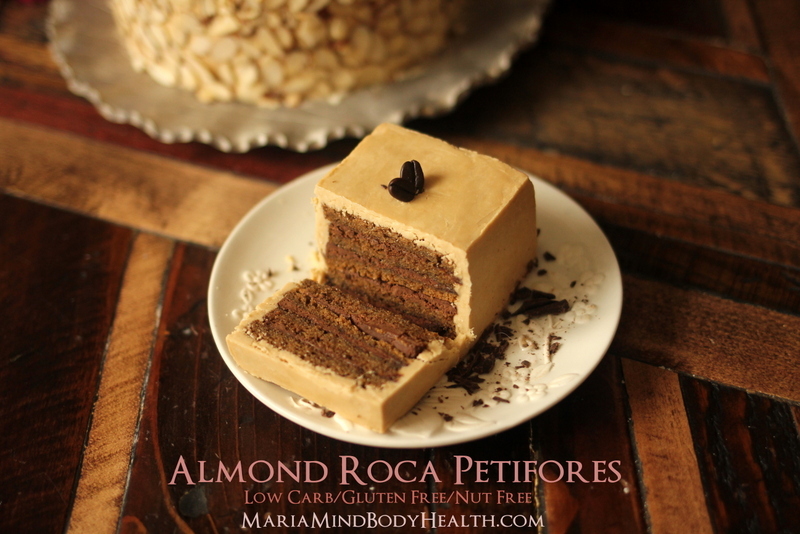 I would love to try the almond roca mocha cake recipe!! i make almond roca candy every thanksgiving and christmas. now i am thinking about making the cake! Maria – I’m so glad you responded to that doctor on the cruise. There are so many whose lives you’ve had a part in changing because of all the options you offer. For some of us who have been on highly restrictive diets and failed as a result, you have been a God-send. Thanks for doing what you do! Thats easy! Amazing bread!!! I make it every week! I love your recipe for Keebler cookies. They really hit the spot! I love all your reicipes I have tried. The protein waffels are my favorite thou! the cc cookies are a favorite of mine! I would love to try Mikey’s muffins!!! You have soooo many amazing recipes! I just love your site! My newest favorite is the Caramello Candy Bar. I’m Sandra from Germany, moving to texas on Monday though!!! Me and my fiance who is Gluten intollerant love your Turtle Cheesecake and will have it as a gluten free cake for our family on our wedding day!!!! 🙂 so everybody can eat good and feel good!!! Getting married 9th of August! We love your coconut donut recipe. This cake looks delish BUT your Heathified Creme Brûlée is EPIC !!! Thanks for all your work with these recipes! Love all of the recipes I’ve tried. Your site is amazing and I wish I had more time to experiment. It amazes me the way you are able to convert any recipe into something delicious and good for us! Such an inspiration! All of the recipes I like but amazing bread is a staple…. Love your turtle cheesecake and pumpkin bread!!!! My favourite recipe of yours is the protein bread made with coconut flour!!!!!!!!!! Hard to pick a favorite recipe because there are several….lol…but id have to say your Keto Cheesecake!…. Obligatory Comment. 😀 I would love to try these. You mentioned in a previous post how good they were, and I checked my local health food shop and they didn’t have any. As for what recipe of yours I like best… so far I’m going to have to go with your faux grits. Grits are just a family favorite going back generations, and I’m so thrilled to have a low carb alternate. My favourite recipe is your slow cooker chili!!! Mmmmm!!! Your salad dressing and BBQ sauce! My fave recipe right now is the Cookie Dough Cupcakes, but Ima have to try out this Almond Roca cake recipe to see if I have a new fave. We love your lasagna!! It is frequently in our menu. Thanks! My favorite recipe is the protein lasagna. Love it. 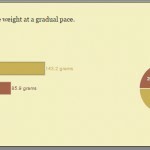 Lay second is your protein bread. Thanks for all your recipes. I can’t wait to try those muffins. It soo hard to pick just one favorite but I really love your bagel recipe. It is to easy to switch up and change flavours. I make these every week sometime more then once. I make a batch for me and a batch for my toddler and preschooler in mini muffin tins and they think they are donuts. We actually call them donuts. These bagels are great to send my daughter to preschool with an a great option for something healthy and nut free as most schools are but free. Thanks you for your amazing work!! I can always count on your recipes and Almond Roca Mocha cake looks like it could be my new go to desert for family gatherings. Can’t wait to try it for the holiday gathering!! I would have to say the Flour-less Chocolate Torte! Fudge, did I say FUDGE!! Hmmmm…so hard to pick a favorite. I teach my friends how to make your yakisoba all the time. So far my favorite recipe is the lemon curd. Absolutely to die for and spot on the real thing. I love your cheese danish! Pretty much all of your recipes are the best! I think the one we eat the most is the chili or the clam chowder. My parents even eat your recipes now too, since my dad is also allergic to wheat/gluten. I think the bread has been a lifesaver for him. 🙂 I guess if we were going to go “sweet” I prefer the avocado sorbet, or the waffles. We’re more savory people, though. Wow…so hard to pick a favorite! Lemons bars are yummy; so are Reese’s Mini-muffins and Lava Cake. And then there’s Chicken Fajita Lettuce Cups and Pecan Rice or Twice-baked Cauliflower. Ugh…can’t do just one. The Peanut Butter Eggs!!! They are so yummy!!! Only recipe I’ve had a chance to try so far is the twice bake cauliflower….yummy! My favorite is your kept fudge! So far the coconut flour donuts. But I haven’t tried very many recipes yet! I love your moussaka recipe! I love the chili. It’s hot summer now so when I want the chili I set the A/C at super cool so I can enjoy chili even more. I’m new to the blog, so I haven’t actually tried any of your recipes yet. :-/ I’ll have to get back to you on that one, but it appears from the other comments that picking just one fav is going to be difficult!! Love the Reuben stuffed cabbage enchiladas! It’s hard to pick just one, but I find myself making cauliflower soup over and over. I love the protein buns because I love to eat sandwiches and this makes it a little easier. I also love the cream cheese Danish!!! And so does my picky brother!!! I didn’t have the patience to scroll thru all comments so I’m not sure if you addressed the eggs?The ingredients call for 2 eggs and in the directions it calls for 4? Sorry, I fixed it above. It should be 2. I love your cinnamon coffee cake recipe! Maria,this cake uses no flour? Thank you for many great recipes! Thank you for the recipe! It’s very tasty, very rich, and I think it’s best after day 1, straight from the fridge (and all the days that follow). We used butter and Swerve from among the options and left out the Kahlua extract because we didn’t have it. We omitted the stevia from the brown butter frosting and reduced the Swerve to 1/4 cup for the mousse. For us, this seemed just right. The cake seemed under-sweetened and the soaking syrup over-sweetened…but the one sweetens the other and the balance is perfect. It’s works well to stab the cake full of little fork holes to get the soaking syrup in there. This was used for my 30th birthday cake, and it was lovely! I made this and it was delicious but when I made the mousse it wasn’t a lot… It was a thin layer not think like your picture…. Did I do it wrong? Or was I suppose to use the icing inbetween? I love your books and your recipes… Down 15lbs in 2 months because of it and I get to eat cake! Love that! Keep it going!